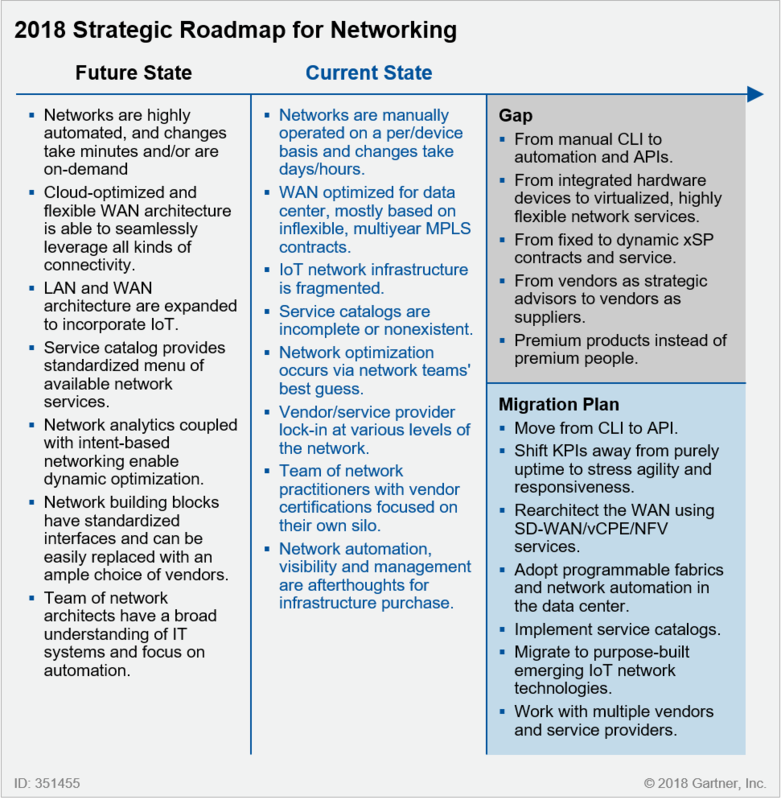 The future-state network is an aspirational view of how enterprise network architectures should evolve to meet emerging business requirements and align more closely to critical business objectives. The primary external forces driving network change are the adoption of digital business and the concept of “digital to the core.” This will result in increased adoption and investments in hybrid-cloud-based infrastructure, platform and application services to meet dynamic business requirements, and a greater focus on always-on service delivery to clients. Digital to the core will also drive IoT deployments to richer, more complex business models and processes, which will compound the pressure of increasing user expectations for consistently strong network performance, quality, reliability and security. This is overlaid with the fact that we anticipate increased pressure from the business to maintain flat networking budgets. As expectations of greater network dynamism become the norm, network service providers will also follow suit with rapid delivery of new enterprise network services. These will be delivered through network function virtualization (NFV) capabilities, deployed on customer-located vCPE platforms, or within the service planning network, in next-generation, Central Office Re-architected as a Datacenter (CORD)-based architectures. We will see a continued trend to leverage software-based, virtualized network solutions deployed with enterprise networks — as xSP services and available as over-the-top (OTT) services from a growing number of players. After decades of focusing on speed, network performance and features, future network innovation will target operational simplicity and business models that closely align with elastic cloud-based services. These services are becoming more prevalent in — and demanded by — organizations with strong digital transformation agendas. The evaluation of networking technology within the most successful enterprises will balance between functional, financial and operational requirements. Understanding when “good enough” is actually good enough will be critical to architecting networks that are ready for digital business.